Done! 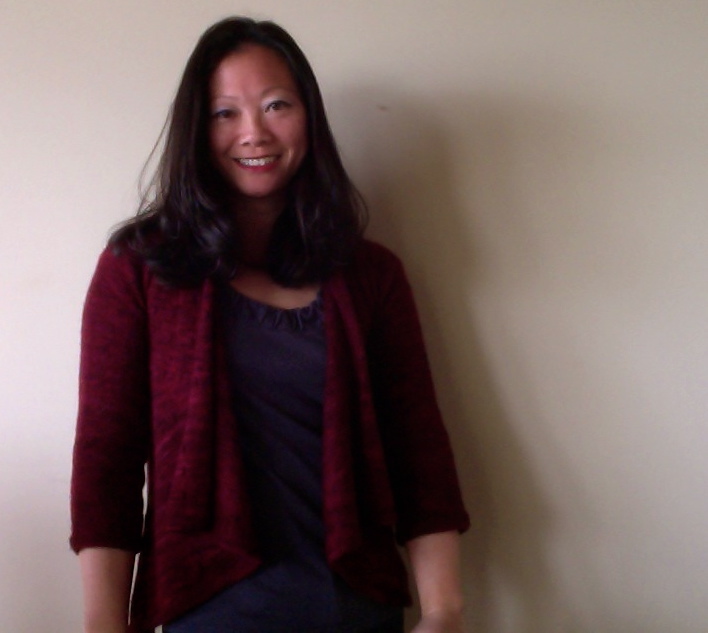 My Vitamin D sweater, started in June 2012, is finally off the needles, and I've been sporting it around town. 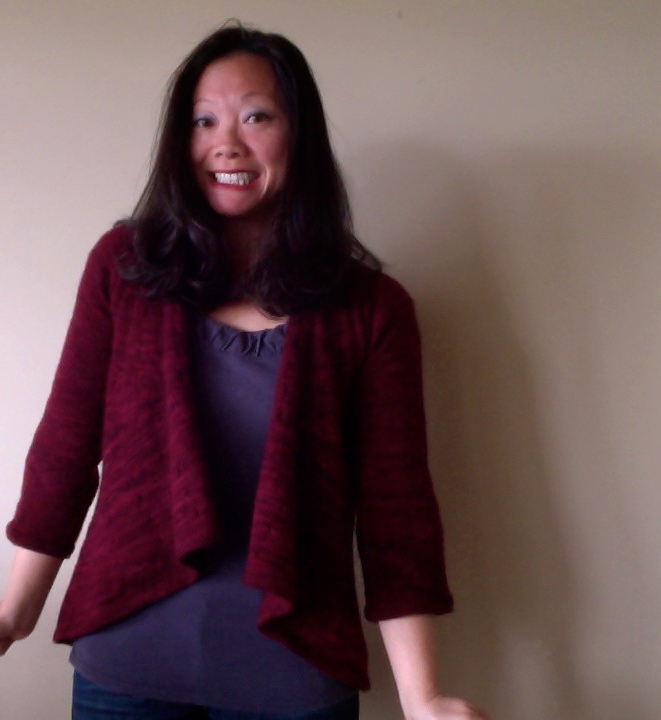 Since I wanted my cardigan to be longer than the pattern suggests, I knit 5 lower body radial rounds instead of 4. The yarn is Lisa Souza BFL DK in the Forbidden City colorway. I purchased this at Stitches West 2012. Happily, this yarn softens up quite a bit after a good soak because part of the reason the cardigan sat around so much was that each time I tried it on, it was itchy. I lost my motivation because I hate wearing itchy wool! But, since my girlfriends have reinstated our weekly knit nights for 2013, I had to do something during that time other than eat cookies, cheese, and drink sparkling wine. So, I dragged the sweater with me. Some nights, I didn't knit a stitch, and then after about the 3rd week of dragging the sweater around, I really wanted it done. Two days later, the second sleeve was bound off and I was ready to soak it. 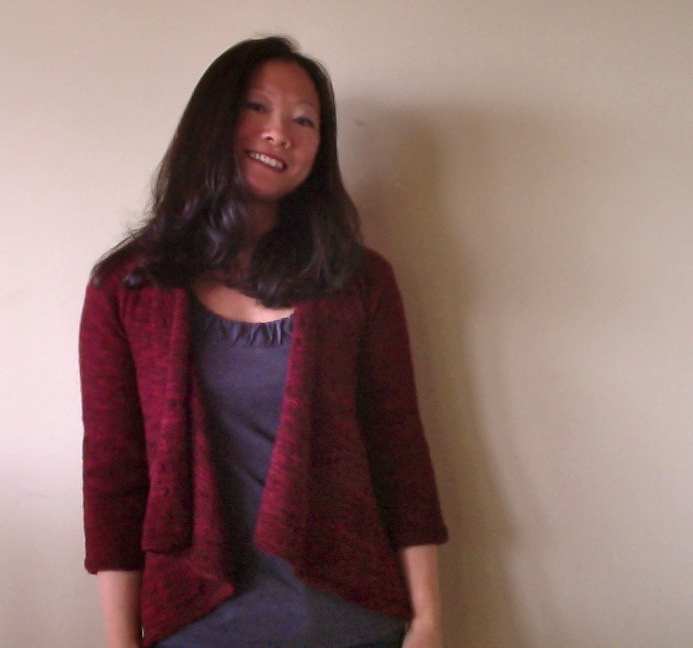 The most exciting part about finishing this sweater is that I no longer have a sweater's worth of yarn stashed away. Wheeeee! This makes me feel free! I have a few single skeins of yarn leftover from projects and some earmarked for socks, but besides that, my stash is teeny tiny. The anti-hoarder in me is rejoicing. More details about my modifications are on my Rav page. it looks fabulous!! and i'm glad you guys are meeting up for knitting again! :) tell them i said hello! xoxo. p.s. what is your next project? Thanks, kimchi! Currently, I'm working on another Wildcat Canyon scarf for my friend who modeled the scarf for me. She's been wanting one for ages! After that, another sweater methinks.